"One of the best things about my job is the variety of the work and the scope for development"
Publishing is one of the UK's largest creative industries. 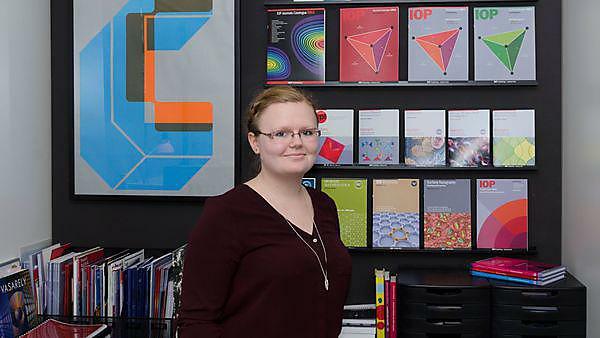 MA Publishing graduate Christina Colwell talks about her career path specialising in rights and permissions. "Since completing my studies I have worked at Walker Books, Springer Nature and now IOP Publishing – moving from Plymouth to London and back to Bristol! I have had the pleasure of working with some very well know titles, brands and incredibly talented authors while at Walker Books and I have loved my time living in London. One of the best things about my job is the variety of the work and the scope for development. I started out in commercial publishing: foreign and translation rights, and now work in academic publishing: permissions and licencing. In Rights and Permissions you can receive a lot of requests to reuse old or obscure material, tracing the copyright owner of these requests can require a bit of detective work on our part!" "Experience is key and contacts in the industry are invaluable. I would recommend taking all relevant work experience/internships open to you and to appreciate the value of networking events. Also, know your worth, after a few internships you won’t be laughed at if you ask about being paid and most internships will reimburse your expenses, so don’t be afraid to ask." "The MA course at Plymouth offers a practical approach to the publishing industry as well as having excellent industry connections. My first steps into the publishing industry came through the extensive connections of the lecturers on the course, and through networking events many more opportunities were open to me: including the opportunity to volunteer at an industry leading Rights conference and literary festivals. The course is also very flexible, giving the students autonomy and licence to explore and initiate projects in the areas that interest them: as well as the day-to-day flexibility which makes the course accessible for those who have part-time employment or family commitments. I would just reiterate the message that you should make the most of the industry connections, extracurricular opportunities and extensive lecturer wisdom available to you: if you can’t find the opportunity for you, the university will support you in creating your own. I have so many wonderful memories, it would be too difficult to pick just one and I think that is what is great about studying at Plymouth: the professional, academic and extracurricular activities available ensure you’ll leave with heaps of positives memories and experiences!"